The Ontario Ministry of Education determines our Catholic secondary school curriculum expectations by grade or subject/course. You can view Ontario curriculum expectations for grades 9 to 12 by visiting the Ontario Ministry of Education. The following are the requirements for obtaining an Ontario Secondary School Diploma (OSSD). Students are required to complete 30 credits. NOTE: All students who choose to attend St. Mary Catholic Secondary School are required to take a minimum of one credit in Religious Studies per year from grade 9 to 12, in order to qualify for formal graduation. The courses of study for these credits are adapted from guidelines for our Catholic school community and listed in course selections. The completed courses appear on the Ontario Student Transcript as credits. 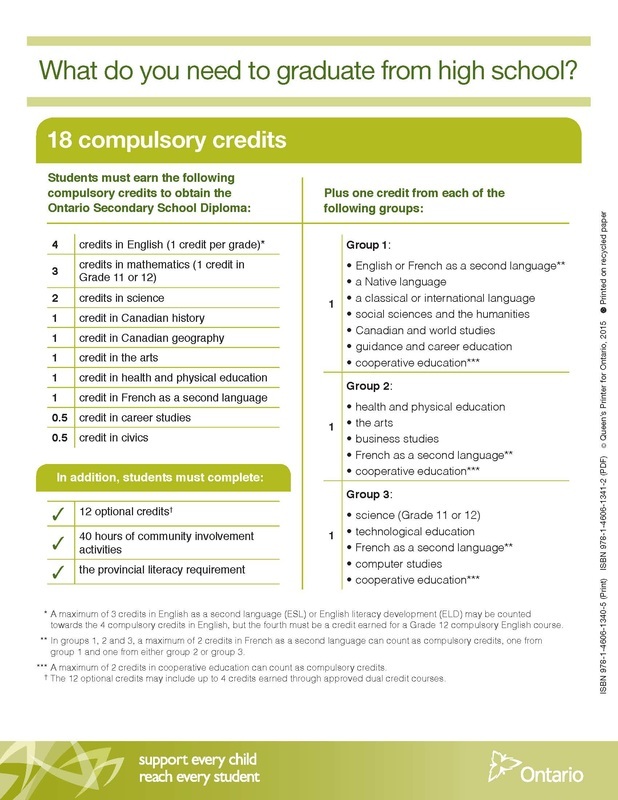 ​(CofA) may be used to recognize the achievement of students who leave secondary school before fulfilling the requirements for the Ontario Secondary School Diploma (OSSD) or Ontario Secondary School Certificate (OSSC) and who plan to take certain vocational programs or other kinds of further training, or who plan to find employment. As stated in Ontario Secondary Schools, Grade 9 to 12: Program and Diploma Requirements all students in Ontario secondary schools must complete a minimum of 40 hours of community involvement activities as part of the requirements for an Ontario Secondary School Diploma (OSSD). As of July 1, 2011, students will be able to start accumulating community involvement hours in the summer before they enter grade 9. The purpose of the community involvement requirement is to encourage students to develop an awareness and understanding of civic responsibility and of the role they can play in supporting and strengthening their communities. PLAN Students under the age of eighteen should plan an activity in consultation with their parent(s)/guardian(s). The activity must fall within the guiding principles the Board has established (see list of examples on the back of Community Service Form below ). GET APPROVAL If the activity is not on the Board’s list of examples, the student must get approval from their principal or school designate (Guidance) prior to the completion of the hours. If completed without permission and permission is subsequently denied, the activity or event will not be counted toward the student’s community involvement requirement. DOCUMENT Upon completion of the planned activity, students should have the supervisor of the activity print their name and sign in the designated area of the form. Students must make sure the form is completely filled in including parent(s)/guardian(s) signatures. SUBMIT TO GUIDANCE Students must bring completed form to Guidance. Hours will then be added to their graduation requirements. If a student completes their 40 hours before the end of June in their grade 10 year, they will receive a Certificate of Recognition at the beginning of grade 11 recognizing their efforts. The principal may request your form at any time. Community Involvement hours must be completed and submitted to Guidance by April of the year a student plans to graduate.